Paploo is a Star Wars minifigure based on the character from the Star Wars saga with the same name. Paploo was an Ewok present during the Battle of Endor, and assisted a Rebel Alliance commando force in deactivating the shield generator, thus allowing the second Death Star to be destroyed. He has appeared in two sets and in two Star Wars video games to date. He has a special body mould. Paploo was an Ewok from the forest moon of Endor. He was the nephew of Chief Chirpa and a close friend of Wicket W. Warrick. He had brown colored fur and wore a cream colored hood. Paploo played an important role in the Battle of Endor. As the Rebel strike team made its way towards its goal of destroying the Endor Shield Bunker, which protected the Empire's Death Star II, Paploo stole a speeder bike from one of the guards, thus creating a distraction. This distraction gave the Rebels an opportunity to strike, and the team succeeded in destroying the second Death Star. Paploo was not featured in the video games, however he is on the covers with brown fur and a sand colored hood, however his ears are also sand colored. Paploo was first released in the set 7139 Ewok Attack in 2002. In this set he came in his first variation. He had short brown legs, a brown torso, brown arms, and brown hands. He came with a larger than normal head piece, that covered the complete front of the torso. The head piece was completely the same colour, which was, in this case, cream. It depicted the facial and body features of the Ewoks. He came with a bow and arrow. 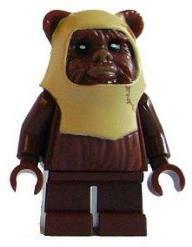 In LEGO Star Wars II: The Original Trilogy, released in 2006, Paploo is seen with the other Ewoks on Endor. He looks identical to his 2009 variation, since in both of these variations, he has small brown legs, brown hands, brown arms, a brown torso, and a similar headpiece, with the only discernible difference being some small features. It is most probable that his 2009 variation was based on his video game variation. The same variation is present in LEGO Star Wars: The Complete Saga. Paploo was released for the second time in the set 8038 The Battle of Endor 2009, in a completely redesigned minifigure. Once again he had small brown legs, brown hands, brown arms, a brown torso, and a new redesigned headpiece, depicting him a brown Ewok wearing a cream colored hood with two orange feathers on it and him having black eyes. The new headpiece looks more realistic compared to that of 2002. Paploo appeared in only two sets. He first appeared in the set 7139 Ewok Attack in 2002, released under the Star Wars: Episode VI Return of the Jedi line, in his first variation. He was later released again in the set 8038 The Battle of Endor in 2009, released under the Star Wars: Episode VI Return of the Jedi line, in his new variation. Paploo was seen in LEGO Star Wars: The Original Trilogy and LEGO Star Wars: The Complete Saga. In both games, he was seen in the same levels and played the same role. In both of the games, he appeared in his video game variation. This page was last edited on 10 January 2018, at 23:37.